Faced with shrinking revenue and dwindling audiences, news organizations in recent years have slashed staffs and reduced coverage. Most news consumers are little aware of the financial struggles that led to these cuts. Nevertheless, a significant percentage of them not only have noticed a difference in the quantity or quality of news, but have stopped reading, watching or listening to the news because of it, according to the Pew Research Centers 2013 State of the News Media report. 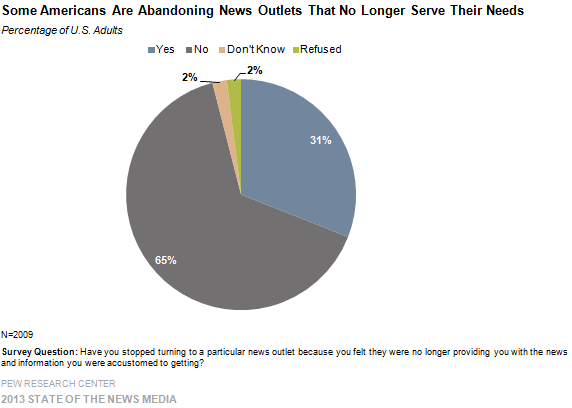 Nearly one-third—31%—of people say they have deserted a particular news outlet because it no longer provides the news and information they had grown accustomed to, according to the survey of more than 2,000 U.S. adults in early 2013. And those most likely to have walked away are better educated, wealthier and older than those who did not. In other words, they are people who tend to be most prone to consume and pay for news. (In the survey, the “news outlet” was not confined to one segment of the media but could have been print, television, online or on other platforms). Despite the audience recoil, the majority of people surveyed early this year had heard little or nothing about the financial problems besetting news organizations. The largest group of respondents — 36% — said they heard “nothing at all” about the issue and the second largest — 24% — said they heard “a little.” That combined total of 60% far overshadows the 39% of people who said they heard “a lot” (17%) or “some” (22%) about the financial woes of the news industry.